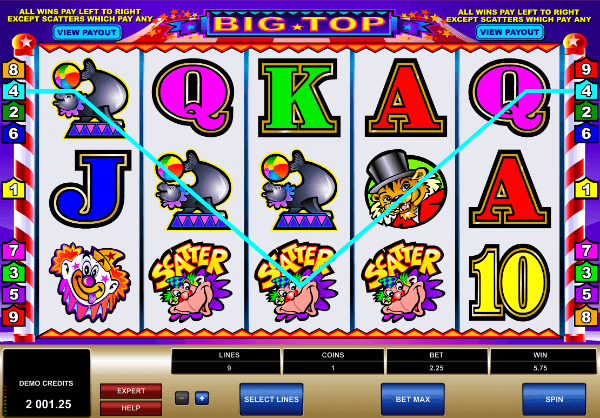 We hope you’re not afraid of clowns because this Microgaming slot has them in droves. This slot is themed around the circus, and all its many performers when they come to town. It used to be relatively popular back in the day, but how has it held up now? Honestly, not that great. The graphics are very clearly primitive, using a lot of playing card symbols, and the existing icons don’t look bad, but they also lack any animations or visual flair that modern games have. It also doesn’t have any special features, meaning your only source of entertainment is simply pressing the spin button and hoping you land a win. The title makes up for it with some good pays and a high maximum bet, but even that isn’t without its downsides. The title is a low variance game with a 96.64% RTP. This means that for the most part, you won’t lose all your cash really quickly, but the jackpots, by extent, also aren’t amazing. It still within Top 10 loosest Microgaming slots but far from Break da Bank Again, Hot Ink and others. 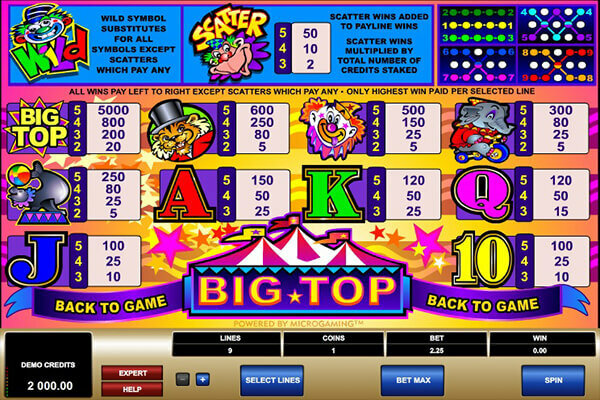 Simple gameplay – if all you want from your slot is to press the spin button over and over until your finger goes numb and your pockets are heavy, this is the slot for you. There’s no special features to chase after, no major game changer locked behind a Scatter. What you see is what you get. Good pays – You have a 5,000x prize for a five-of-a-kind Big Top symbol, and while the one following it up is a sharp drop at 600x, it’s nothing to sneeze at. If you manage to land the jackpot, you’re probably set for a while, but given the low volatility of the game, we don’t see it happening anytime soon. Absurdly high cost – We don’t know whose bright idea it was to make the minimum bet $2.25 per spin (all 9 lines), but they killed a lot of momentum this slot could ever have had. You can bring that down by turning off paylines, but you shouldn’t have to have most of your paylines turned off to have a decent minimum bet. Best we can tell, Microgaming wanted to gear this towards high rollers, but the low volatility of the title really clashes with that, and leaves it a mess. A slot minimum deposit players definitely should skip. No special features – this can be a positive and a negative for people, but for us, it’s a negative. There’s a reason games have so many bonuses nowadays. They’re fun to activate, chase after and their impact is visible in your wallet. While some players might appreciate this title having no bonuses as a way to relax, there’s a fine balance to strike between too many features and none at all, taking it to one extreme over another isn’t the solution. Despite being all about clowns and the circus, Big Top doesn’t offer any entertainment in form of special features. Honestly, we’re quite conflicted on this Microgaming release. It’s clearly a product of its time, back when slots were simpler and boring. If we were reviewing it back when it came out, the high cost would probably be our only gripe. But now, in 2018, we have to look at its competition as a whole – and it just fails to measure up.